The opening narration tells us how Mega-City One is a love it or hate it situation, but how lately there’s a lot more hate going around than love. Anti-alien ads are placed around town, no one is happy – the place is a cesspool. But it’s a Hell of a lot better than what lies outside the city limits: the irradiated wasteland that is The Cursed Earth. The only thing standing between chaos and humanity, the only ones keeping things in check? The Judges. 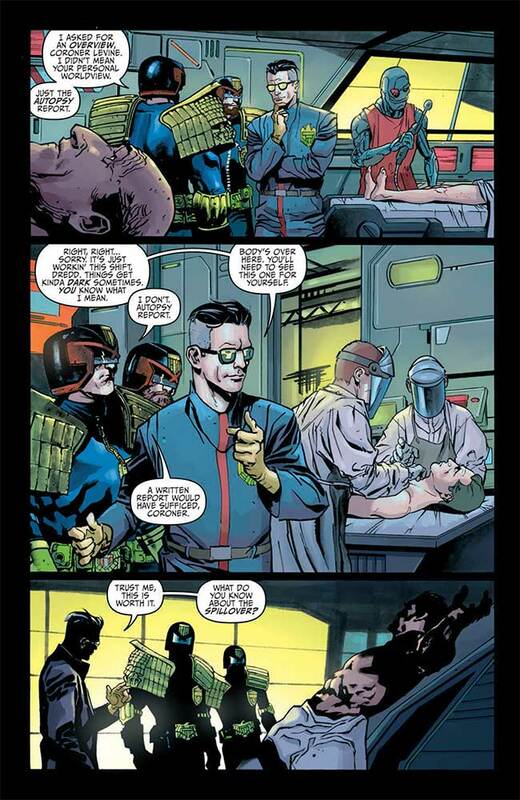 Dredd’s talking to a coroner about an autopsy that was just completed. 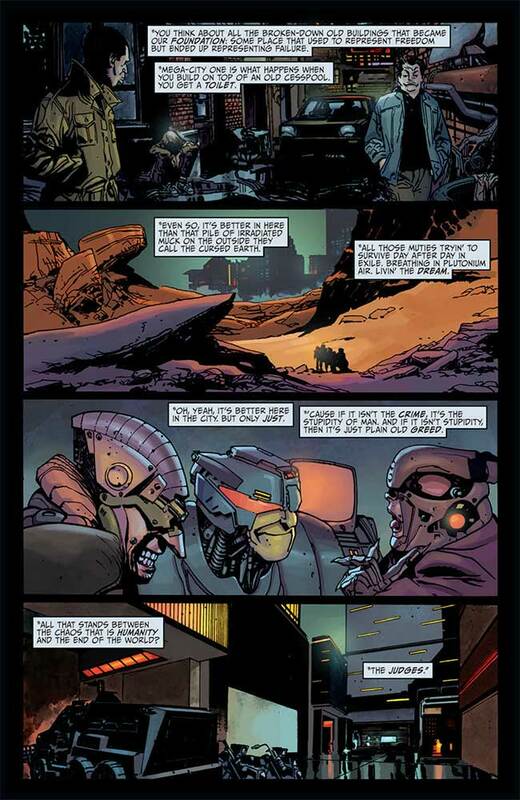 Dredd’s asked what he knows about the Spillover – the sewers of the city - and he tells the coroner the cops don’t go there, it’s toxic and its inhabitants, genetically modified people known as the Scrubbers who are able to breath down there, police themselves. The Scrubbers, however, are muties – or at least they look like them. The world above them doesn’t want them as neighbors. 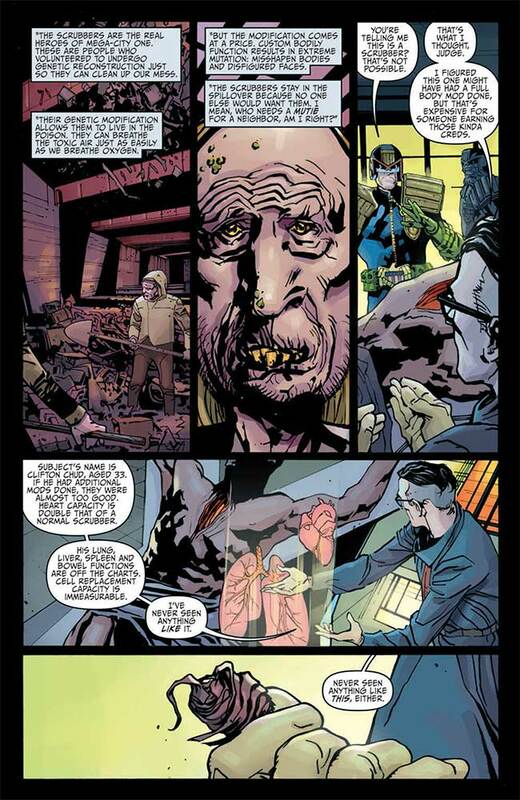 The body on the table in front of Dredd and the coroner, however, is the body of a Scrubber. The coroner found a sentient symbiotic parasite in his thorax, a species that doesn’t have a match in their database – they don’t know what it is. This thing may have had a psychic connection with the body it was found inside. Not wanting word to get out and hoping to prevent a parasitic spread, Dredd heads into the spillover to talk to those who may have known the corpse, Clifton Chud. It turns out he had an apartment aboveground and that he even had a girlfriend. Dredd has the foreman get the Scrubbers together so that he can interview them. Once he confirms that their papers are in order he tells them what the situation is and offers amnesty to anyone who might want to confess to harboring an illegal alien (the parasite). Eventually a female Scrubber named Grid agrees to talk to Dredd and Judge Anderson of the PSI division. Grid has a parasite inside her and Anderson makes a link, learning that the parasites came to Earth by accident and have no way to get home. Most of the Scrubbers carrying the things they call Blenders are ok with the arrangement – they help the Scrubbers and in turn, they help the city. The Blenders want amnesty… but in Dredd’s eyes they broke the law and then there’s the not insignificant matter of a certain blow hard politician leading the protests outside the Chief Justice’s office and the horde of armed anti-alien activists trying to make their way down into the Spillover to take care of business themselves. If nothing else, the current American political climate has been good for Judge Dredd comics. The current orange occupant of the Oval Office even makes an appearance in this issue, meaning that Paul Jenkins’ script is less than subtle. That said, it’s quite effective, making you think about the situation at hand, the morality of the predicament and the pros and cons of relationship that exists between the Scrubbers, the Blenders and the citizens that live above ground in Mega-City One, benefiting from that relationship themselves without realizing it, and only too quick to take up arms against a ‘menace’ that they don’t care to try and understand. It’s a good fit for Dredd. He’s a character that typically sees things in black and white – legal or illegal – and that hasn’t changed this issue. As such, he’s not so much a hero here as he is a willing tool of the higher ups. He’s got a job to do, emotions don’t factor into this – he literally says as much to Anderson, knowing that once she understood the issue she may sympathize with the Scrubbers and Blenders and not allowing himself that option. He’s a straight law and order man, and that’s that. It’ll be interesting to see where Jenkins takes the story in the coming issues. As far as the artwork goes, Marco Castiello does a nice job here. There’s good detail in the art and the coloring work from Jason Millet is pretty strong. Castiello does a nice job of making the city seem appropriately huge, massive and sprawling. He also makes the Spillover seem as nasty as it should. There’s good detail to the human characters that populate this story, nice facial expressions helping to accentuate the drama of Jenkins’ script. 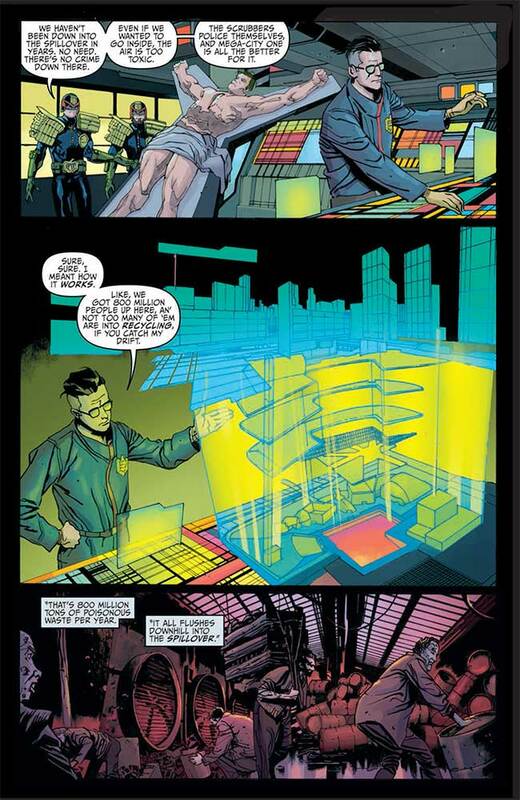 The panel layouts are reasonably conservative but it works, there’s good flow and movement to the artwork. A good first issue should leave you wanting more, and this one does just that. There’s a good hook here, it makes you want to find out where the story is going, how it’s going to play out, and where Dredd specifically fits into all of this. 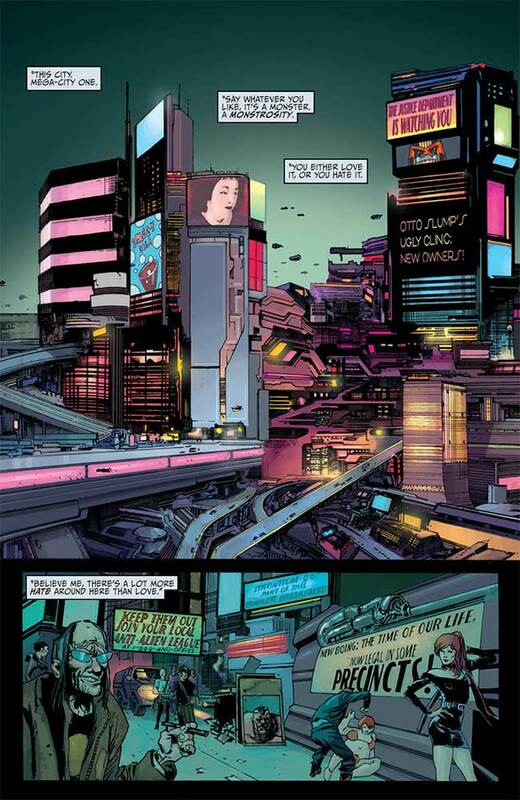 We’ll get there in future issues to be sure, but so far so good – Judge Dredd: Toxic #1 is great stuff.